On Saturday 24 February the Council of Deacons gathered with Bishop Séamus at St. Hilda's on West Road for their latest bi-annual meeting. 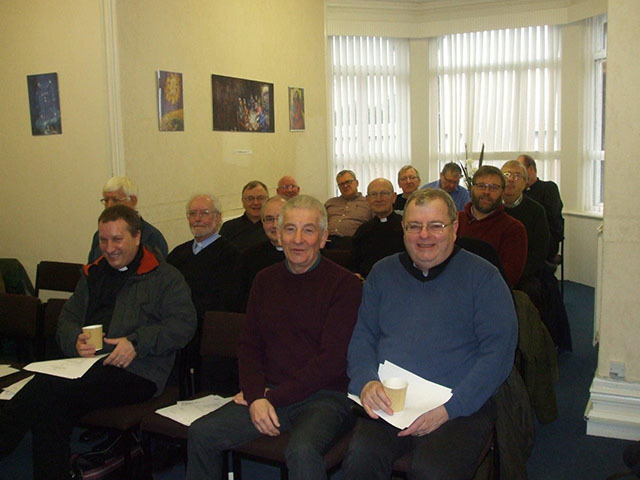 It is a regular opportunity for our deacons to get together, share experiences, swap ideas and find ways of supporting each other in their ministry. A key area on a what was a full agenda was reviewing how deacons were involved in our new partnerships as they are developing. There were lots of real good news stories shared about how they are getting to grips with the new reality. Importantly that meant lots of good ideas to take back and share in our their communities. Bishop Séamus stressed the need to be that encouraging a growth in spirituality and how deacons had a role to play in that important area. Following on from the Bishop's Pastoral Letter earlier this year on the diaconate there was a discussion about how it had been received amongst the congregations (positively and with interest it seems) and how deacons were progressing in the initiative Bishop Séamus talked about in his letter of getting out to all the parishes in the diocese to give a personal message about their vocation and ministry. It seems a lot of progress had been made already and the group looked at how they could give support one another to get round all of the parishes across the diocese by Pentecost. Read more about the proposed parish visits. The group also looked at their own formation and some discussions took place focusing on some particular questions about the nature of diaconal ministry and how this might evolve in the context of partnerships. The fruits of these discussions will form the basis for the diocesan deacons retreat which will take place later this year at Ampleforth. After a year in post Deacon Paul Hargreaves, due to growing commitments elsewhere, stepped down from his role as Secretary to the Council and Deacon Shaun McGee from the Pontop Partnership kindly agreed to take on this important role. Details of how one can apply to become a Deacon can be found on the Diocesan website.